Over the last 8 months, I have spent a good chunk of my time volunteering as part of the BC Wine Appellation Task Group. This group was given the mission statement “To engage the BC wine industry and use their input to recommend improvements on our system of appellations, and the certification for wine produced from 100% BC grapes.” The goals of the group were to take a serious look at what needs to be changed in the BC wine industry to help it evolve and continue maturing into a serious wine business. Now change doesn’t come easy, especially with such a diversity of winery sizes and so many different characters with such varied ideas as to which way we should point the BC wine ship. Luckily the Task Group was made up of many of the industry’s best and most knowledgeable voices, all with the same goal: to help push BC wine forward (See a list of the group – Task Group bios). The Ministry of Agriculture also got in on the act, an important level of support, but other than that there was no link to any of the other myriad splinter groups or organizations that exist for BC wine. I have written some of my views on the appellation subject before back in January 2015 (Sub-Regions in British Columbia) so it was exciting to have a chance to turn what were just ideas and opinions towards what could help with important change and help make BC wine make sense. This month’s BC Wine Report is my personal take on the Task Group recommendations. To work in cooperation with the BC Wine Authority to bring forward industry recommendations to propose amendment(s) to the Wines of Marked Quality Regulation that represent the interests of all 100% BC Wine Producers, to better meet the demands of today’s market conditions and for potential application for other sectors including 100% BC fruit wine, ciders and beer. The entire report can be viewed here (Wine Industry Turning Point). Skip to page 38 for a list of the specific recommendations. The most exciting thing about this process was how readily everyone agreed on so many of the things that needed changing. Aside from a few standouts that believe in keeping the status quo, the vast majority of those in the group or those who were contacted through the various surveys and town hall meetings saw the need for evolution and change. The BC wine industry is growing up. I was part of a sub-committee to look specifically at the appellation issue. The simplest part of upgrading the appellation system to me seems to be creating new regions to cover the emerging vineyard areas in Lillooet-Lytton, the Kamloops/Thompson Valley area, Shuswap, and the Kootenays. 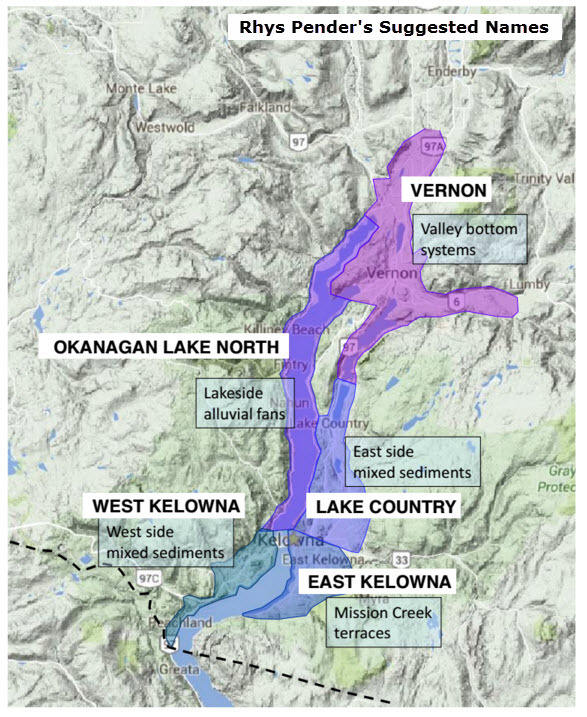 Pat Bowen, researcher at the Pacific Agri- Food Research Centre (PARC), was brought in to give some scientific grounding to the regions and drew up maps for these four areas based on the watersheds of the area, the same criteria that was used for the Okanagan and Similkameen regions. Dividing up the Okanagan into sub-appellations wasn’t going to be so simple. Many wineries expressed interest that they want to be able to give consumers more information on the label about where the wine is grown. I had argued in my January article that BC needed to build a correlation between place, grape variety and style that consumers can start to understand. The main culprit for needing the relief of sub-appellations is the Okanagan Valley. With 84% of the vineyard acreage and a much higher percentage still of production, the Okanagan is too big and too varied to have any real meaning to consumers in terms of a recognizable wine style. But how to divide it up? There were a number of important issues to consider in the recommending of new sub-appellations. The world is basically full of meaningless regional boundaries for wine that look okay on paper but don’t hold up to any scrutiny on the ground when you visit the place. They are often politically derived, marketing derived or follow a different set of criteria that has nothing to do with vineyard, grapes and what the wine ends up tasting like. The group wanted to make sure there was some basic degree of scientific rigour behind what was recommended, something that could eventually show itself as terroir in the wines. The challenge then becomes how to keep it real scientifically while also being user friendly. WineAlign critic and long time advocate for sub-appellations, Anthony Gismondi , was brought in by the group for the first meeting to give an outside view from that of winery owners and hammered home the message that the sub-appellations must be consumer friendly and ideally should link the name of the region to the neighbouring town. Fortunately, this mindset was largely supported by the group and formed the framework for most of the discussions. As to how to carve up the Okanagan in to sub-appellations, a number of different ideas were floated. Ideas such as dividing the Okanagan into just three regions of North, Central and South kept popping up but the consensus was that it didn’t go into enough detail. The group was also concerned that making too many sub-appellations too quickly could be confusing for consumers. Pat Bowen again came to the rescue and created a number of scenarios that had enough scientific rigour. These first divided the Okanagan climatically into north, central and south, then by geology and finally aspect to take into account the different levels of sunlight depending on which side of the valley the vineyard is located. So far these have been left unnamed but the group did come up with some criteria for naming to keep the appellations very user friendly for consumers. The group recommends only accepting a village or town name, or a place name that is historically associated with a region. The group voted on 15 separate regions, something that seems like a lot but in fact are all quite distinct regions, with a couple of exceptions. 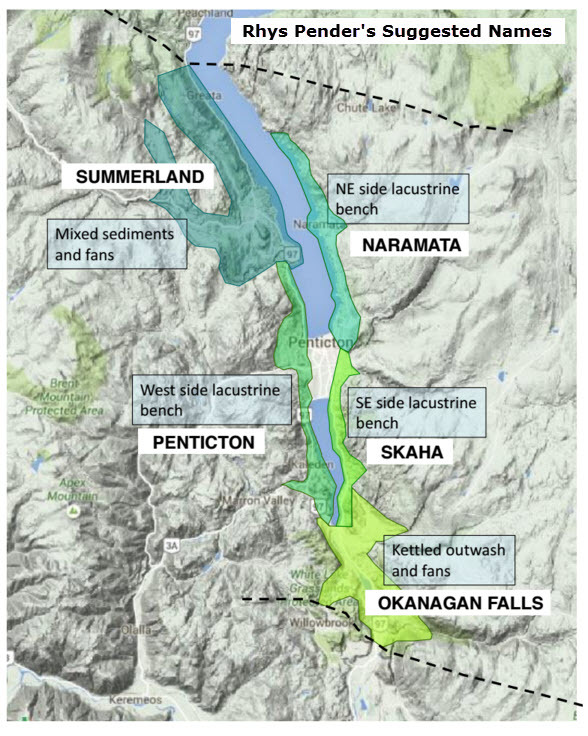 One contentious point was the lacustrine benches on the east side of Okanagan and Skaha Lakes which are very similar scientifically but, for the sake of the consumer, the group voted to separate these into the area north of Penticton, commonly known as Naramata, and the benches above Skaha Lake. Naming the regions will be a bit challenging but if the guidelines are followed the result should make sense for the consumers. I have come up with my own suggestions for the naming of the regions (see below, click to zoom). Some of these are difficult, particularly the area that I have called Okanagan Lake North and the areas around Oliver; they could also be named Oliver West, Oliver North and Oliver East instead of Oliver, Oliver Terraces and Black Sage). Naming after the villages in most cases is the best as consumers are already familiar with the main villages and towns of the Okanagan, and can see them on any map. East versus West side of the valley also makes sense given how big of a big difference there is in morning versus afternoon sunshine. One important point to remember is that there is still the potential to create smaller, more terroir based sub-appellations within these proposed regions. For example, Kaleden might want to separate itself from the rest of what I have called the Penticton appellation and Peachland may want to do the same from West Kelowna. The existing sub-appellation (the first in BC) of Golden Mile Bench would be an example of a smaller, more terroir driven appellation that is essentially the next step in defining Okanagan terroir. I will be interested to see what others come up with for naming suggestions. A number of those consulted were very wary of jumping into sub-appellations when they felt that the Okanagan was just starting to gain some recognition. This is an important point and so the group is recommending that any new sub-appellation can only be used if appended to the name Okanagan Valley on the label. For example, a label would show “Golden Mile Bench, Okanagan Valley BC VQA” or “Summerland, Okanagan Valley BC VQA.” Let’s not throw the baby out with the bath water. There is also a proposed amendment as to who gets to vote on any new sub-appellations. The current wording only allows those who have the physical winery building located in the proposed sub-appellation to vote. The amendment would allow other wineries that own vineyard land in the proposed area to vote too. It just makes sense. What will probably be the most contentious issue is compulsory membership of the British Columbia Wine Authority (BCWA). Whether known to consumers or not, there has always been a big split in the BC wine industry. Currently, wineries can choose whether or not they join the BCWA. If a winery does join, they are subject to audits ensuring they are following the rules set out in the Wines of Marked Quality Regulation. But if a winery doesn’t want to join then there is no organization with the authority to ensure compliance. Essentially, by opting out you are above the law. For example, a BCWA winery cannot put Naramata on a wine label, even if all the grapes come from there because it is not yet an official region in the Regulation. But a non-BCWA winery could put Naramata as a region, even if the grapes don’t come from there, as there is no group who can police the use of such terms. These wines are currently called BC Wines of Distinction, a term I have never seen on a label. They are essentially non-VQA wines that can still use the regional names. The only thing they miss out on by not being VQA is a few market benefits awarded only to VQA wine. The Task Group is recommending that joining BCWA is mandatory if you want to have a winery license. The internal political splits in the BC wine industry appear petty and make the industry look less serious from a global perspective. It’s time to change. A non-VQA but 100% BC wine would be labelled as “Product of British Columbia” as a geographical indication (GI) with no further, smaller delineation allowed. This would become a category for experimentation of different styles that could eventually be incorporated into the Regulation. For example, sparkling wines under the Regulation must have a minimum 8.5% alcohol meaning that Moscato d’Asti style wines are actually not permitted as a VQA style. If enough producers were making this style it could be incorporated into the Regulation. Like I said, this one will be controversial and I am sure it will be heavily debated. However, I believe that as the industry grows and is increasingly getting international attention, working as one will be both necessary and beneficial. The End of VQA Tasting Panels? Another recommendation from the group is to end the use of VQA tasting panels. As some voices have said, these panels were helpful when BC wine was a fledgling industry, a lot of the wine was not so great, and we needed a check before the VQA seal could be given in order to help build a quality reputation. Today though, with high quality levels, few really poor or faulty wines and lots of experimentation in things like orange wines, amphora, wild ferments, concrete, etc., the panel is more likely to hold back evolution rather than offer any kind of security of quality to the consumer. Instead of the tasting panels, the Task Group recommends relying solely on accredited laboratory analysis to ensure that BC wines meet existing health, safety and technical standards as per the Regulation. Wineries have to provide all this information to the BCWA anyway before the tasting panel so it is just one less step and the industry now feels confident that the market, rather than a tasting panel, can decide whether a wine should be successful. The final section of recommendations revolves around audits, hardly something to get consumers excited but important for producers. The Task Group recommends that the current three separate audits by the Liquor Control and Licensing Branch, BC Liquor Distribution Branch and the BC Wine Authority be harmonized into one. All of them look for basically the same info but in different formats wasting the time of everyone so it makes sense on all levels. Wineries would still be subject to a separate Excise audit but reducing the number from four audits to two is a helpful step in the right direction. If you made it this far in this long article, you must be interested, and you also probably realize that many of these proposed changes would have a significant effect on the ability for the BC wine industry to evolve to the next level. The wine quality is there, it is time to take it seriously and start to build something that can help launch the next level of making BC wine a serious quality contender on the world stage. The BC Wine Report is a look at all things in the BC Wine Industry. In addition to this, we publish our popular 20 Under $20 shopping guide and the BC Critics’ Picks report including the wines that excite us each month. Lastly, Anthony Gismondi closes out each month with his Final Blend column – an expert insight into wine culture and trends, honed by more than 25 years experience as an influential and global critic. Hope you enjoy. A mind of the caliber of mine cannot derive its nutrient from cows.